Happy Saturday! YAY weekend! Before I get into the POWW faves, I wanted to share a few recent thrifty finds that are for me. I think the master bedroom may be next on the list, and this past week I brought in a few new touches. Last week, I showed you our new quilt, and last Sunday we hit IKEA. I was searching for some pillows with a punch of color, but didn’t find any. I did, however find two pillows that were meant for our bedding. They couldn’t be any more perfect! Anyhow, I tried out Tuesday Morning this week, and found a great little pillow with the color I wanted to bring in, and it had a $9 price tag! I actually bought 2 since they only had 2, and figured I could return the other one, but I don’t think I need to and you will see why in a minute. I’ve been hitting the thrift shops this week, and Sarah introduced me to a new one (Thanks, Sarah! ), which may end up being dangerous. I found this chair there for $26! I just love its curvy legs, and it is in great shape! It now sits in the bedroom, and the spare pillow may or may not stay. Here it is in the corner of our bedroom, next to our armoire. I also hung a couple family pictures in the corner. Of course, this room has yet to be painted, and the trim will get painted as well! 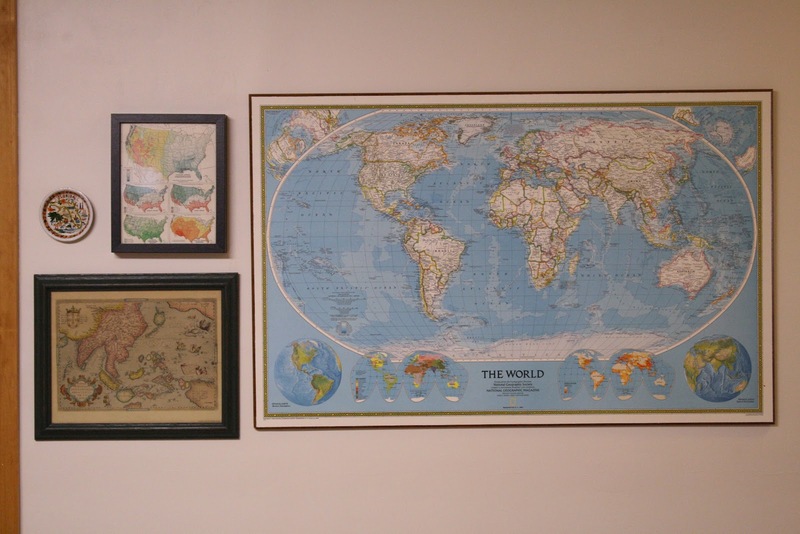 The giant map had a price tag of $15 and was already mounted and ready to hang! I was thinking it would have been nice if it was more vintage as opposed to only 10 years ago, and then I realized that 1992 was not just 10 years ago, but 20. Really? 1992 was 20 years ago??? Ugh. Moving on, let’s check out this week’s POWW faves! This stained Union Jack table from Domestic Imperfection is, well, perfection! 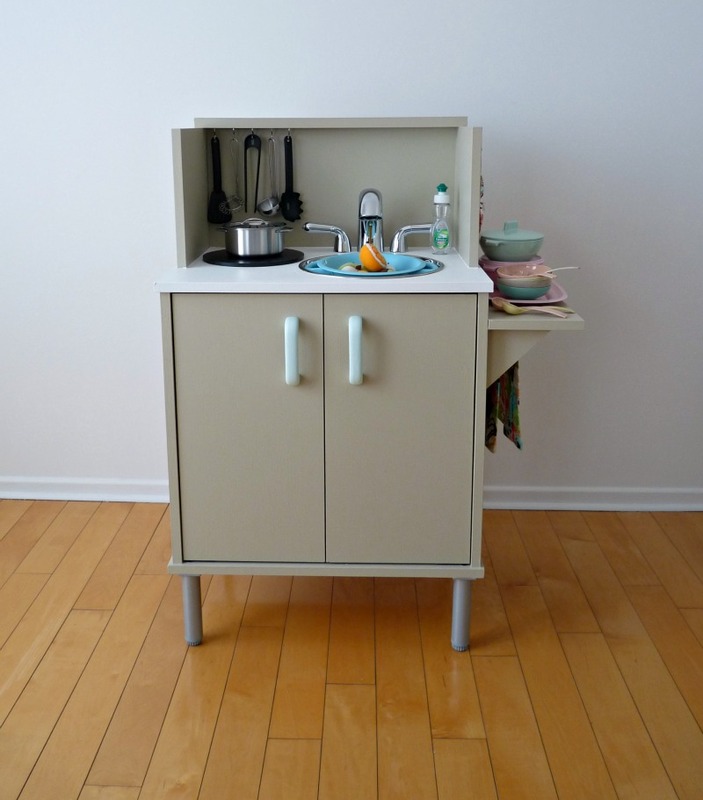 Love this sweet play kitchen from Dans Le Townhouse, and it is accessorized beautifully. Emmy would love playing here! The Junk in Our Trunks shared this fun chalkboard dresser, with paper dolls painted on it! Emmy would love coloring this girl in, too! It’s such a fun idea! The Charmed Nest shared this awesome black dresser. I love the combination of the black with the natural baskets. 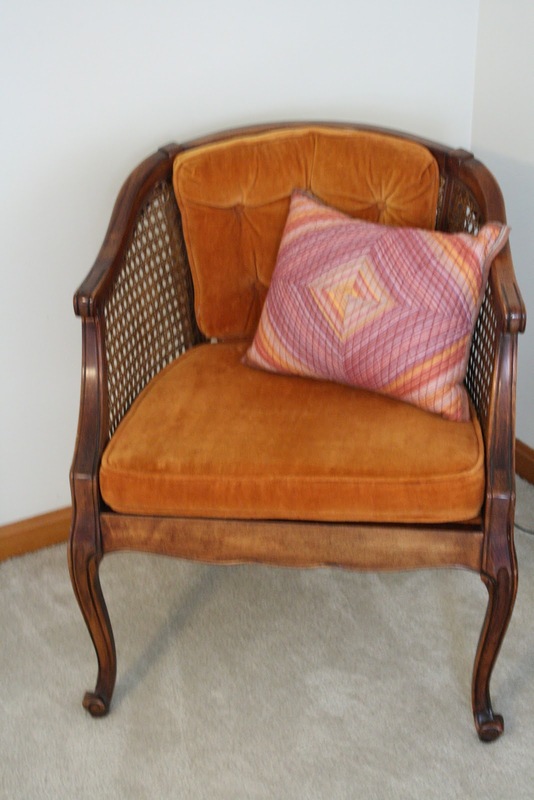 Shari from Turnstyle Vogue shared a great idea for spindles on chairs- wrap them in twine! Kammy from Kammy’s Korner shared this beautiful dresser. Pretty, pretty, pretty! That’s it folks! Happy weekend! Cassie, thanks so much for the feature of my black buffet! Lots of talented ladies up there. The little kitchen is particularly awesome! I know EXACTLY what you mean when you find it hard to believe the early 90’s were 20 years ago, lol! I think it means we are getting old…eeeek! Great pillow find! Those dot pillows from ikea are great too. I’ve looked at them a time or two. Love the pillow and such a deal on that chair! It looks great in your room! The cushions are adorable. I am smitten with the chair. I would love to find one like that. That chair is awesome Cassie! Are you planning on leaving it as is or refinishing it? I know exactly how you feel about 1992 being 20 years! Holy canoli! Have a great weekend! Love the features! I love the dresser from Kammy’s Korner – the color and detail is so pretty!! I like the color as an accent your blue & white bedding. Good finds this week! I like the CORAL that is! 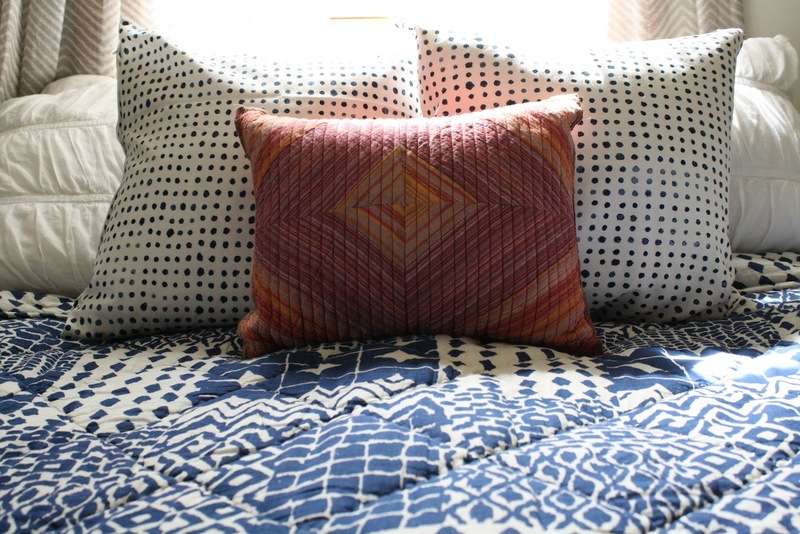 Plus I bet those pillows could find other homes in your house with all your new coral accents! I love the chair you found (fabulous legs indeed). I’m off thrifting this afternoon, so wish me luck! 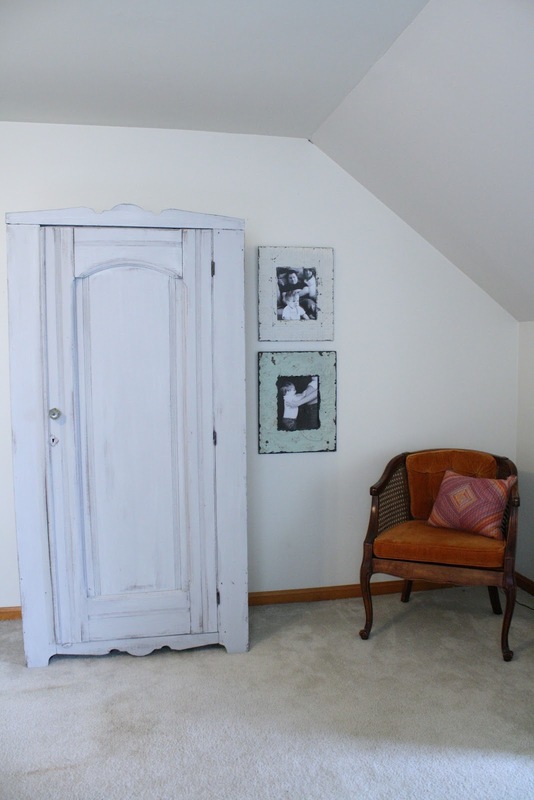 Love the armoire/chair/picture vignette in the bedroom! Wow. What a terrific buy on that chair. I love the cane and legs. Thanks for showing mine off as well! Love the pillows and maps in your bedroom. Oh, and that armoire? To die for. I literally woke up this morning thinking about two pieces of furniture that I have that need some TLC and paint treatment and going through my head how I would attempt to fix them! Thanks Cassie for featuring my dresser. I hope you have a winderful weekend. I am so glad you love your new chair! We have to hit the thrift store again soon. The maps grouped together totally rocks as well! Love those polka dot pillows from Ikea!!!! And I can’t wait to see how you transform that adorable chair Cassie, great finds! You always get the best link ups for POWW, I am especially enamoured of the chalkboard dresser with teh paper dolls, very clever. Don’t forget to hop over and enter the Perricone MD $150 cosmetics giveaway!!! That chair was a great find! I love it and it’s perfect in your bedroom. I just saw those dot pillows at Ikea and admired them. They look great on your new quilt. Another week of fabulous featured projects! glad you like the bikes! me too. they are approx 12 inches tall….about 19 long. they are $15 each. I love the chair and what a great buy! And I’m a map fan too! … Great features! I always loved those chairs and the maps are way cool. Love me some Thrift shopping. I posted mine today too. Love the chair Cass!! I’ve been hitting the thrift store closest to my house on an almost daily basis. I am determined to find cute pieces of furniture with all the right curves…like you do! *fingers crossed* Have a great weekend! That is SOOO not allowed to be 20 years ago! We’re ancient. You have got to be exhausted with the whole house re-do. We’ve been here 6 years and it still hasn’t stopped….Something breaks, needs to be fixed, and then I change my mind like the wind. Love all your features and I had to go pin that twine wrapped chair. Such a cute idea! Thanks (as always) for all the inspiration. I have those Ikea pillows! Between your yard sale finds and that great chair for $29, I’m thinking a move to mid/northern MD should be in my future–well, at least a road trip! I love your chair – great legs, and what a great colour! That chiar is an amazing find! I found my cane barrel chair for $30!! Always the price point that makes it feel special! Great features! That Union Jack table is AMAZING! Wow, that chair you picked up is FABULOUS. I love it. And the pillows look really cute with your bedding! Also? That black buffet is killing me. Seriously gorgeous. Love your new chair and pillow! That union jack table is awesome! You weren’t kidding about the thrifting mojo! Great chair and armoire!